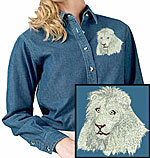 Women's Denim Shirt with White Lion High Definition Embroidery Portrait #2. The 7 oz. 100% cotton denim stonewashed shirt has yoke back and button down collar. The ladies denim shirt don't have pockets.